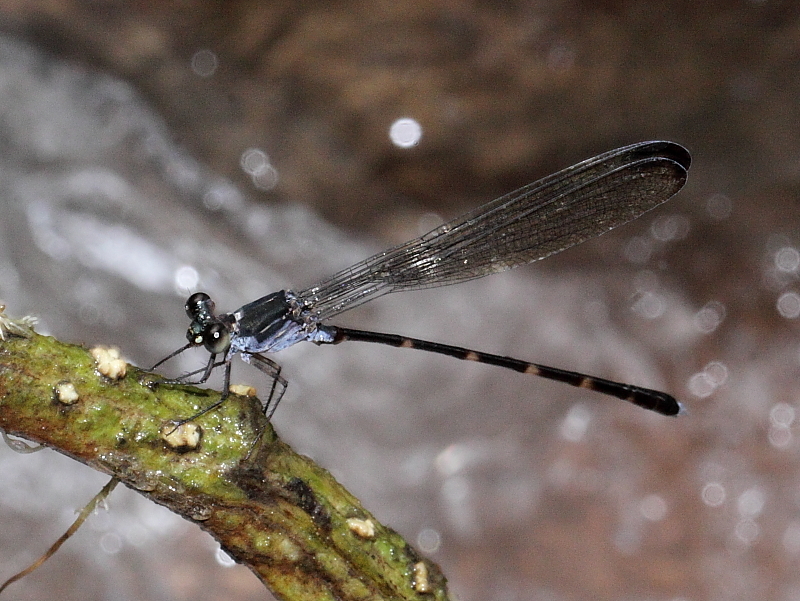 Malayan Grisette is an uncommon damselfly which is very localised and is only found in the primary forest streams in the Bukit Timah and Central Catchment Nature Reserve of Singapore. 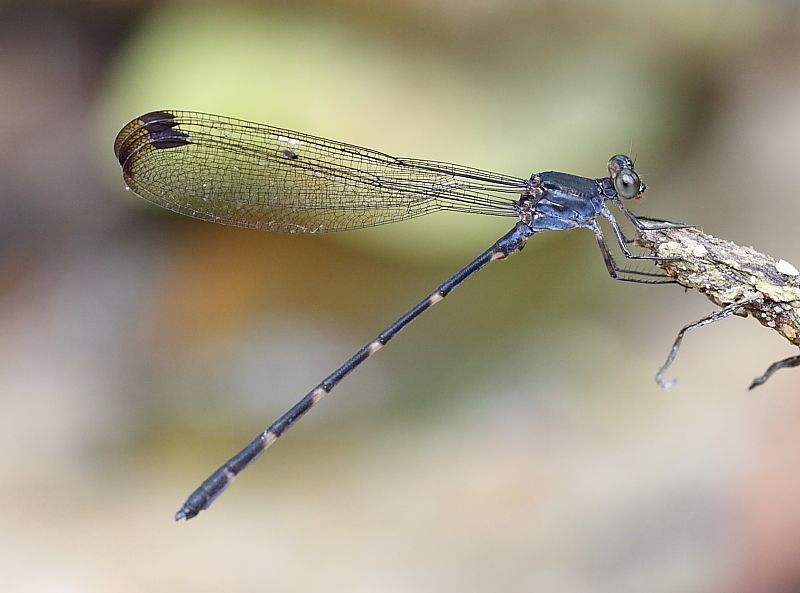 This damselfly is robust and has a dull brown-bluish colour throughout the thorax. The abdomen is brownish with yellowish side spots. Wings are hyaline. 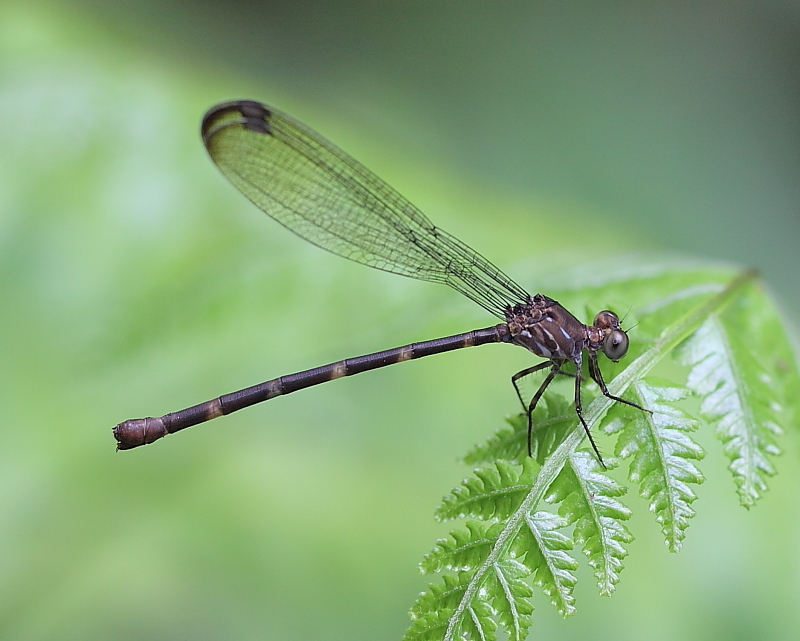 Female is duller in colour, more robust, but otherwise, similar to male in appearance. 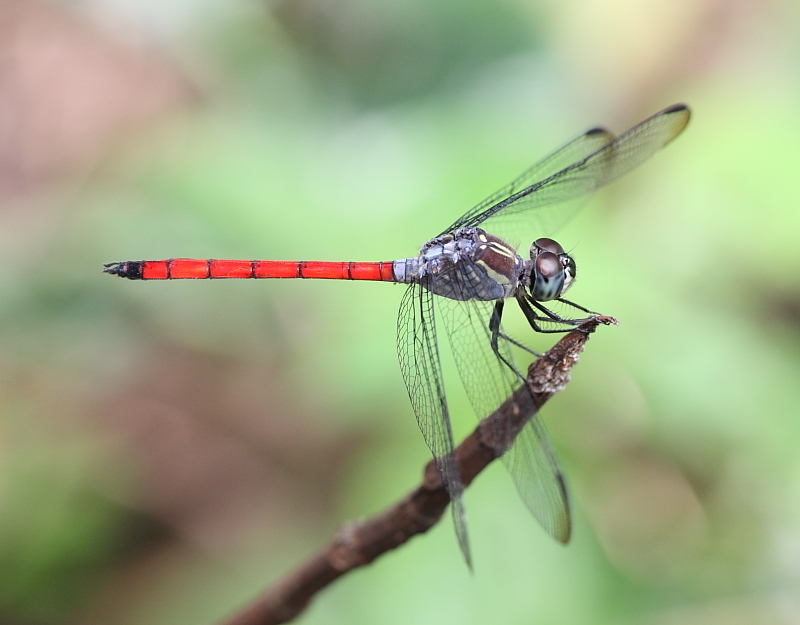 Scarlet Grenadier is a relatively common dragonfly and can be found in most forested nature reserve of Singapore. 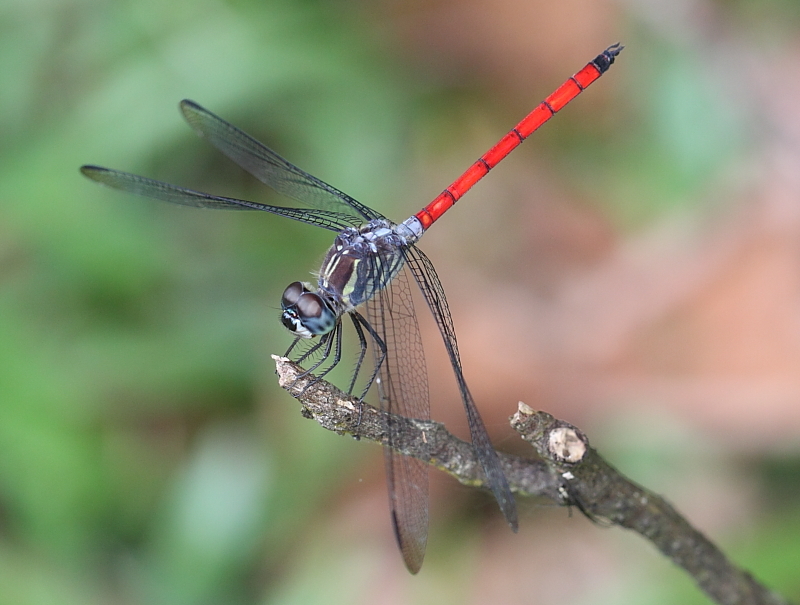 The abdomen of the male is straight-sided and red in colour, except for the last two segments, which is black. 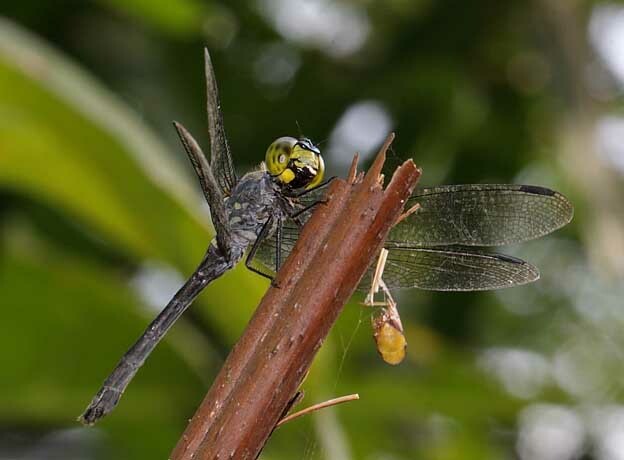 The thorax is dark brown with yellowish stripes. 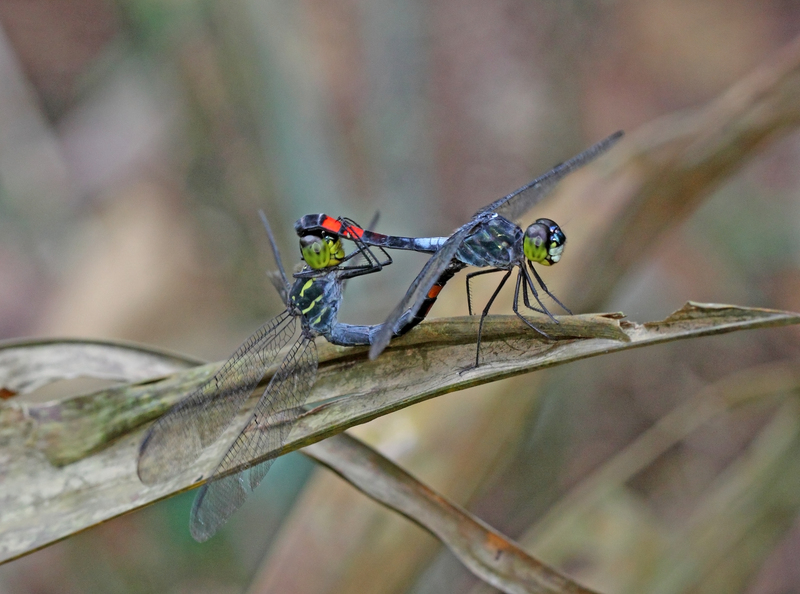 Older male is pruinose and the thorax turn to dark purplish in colour. 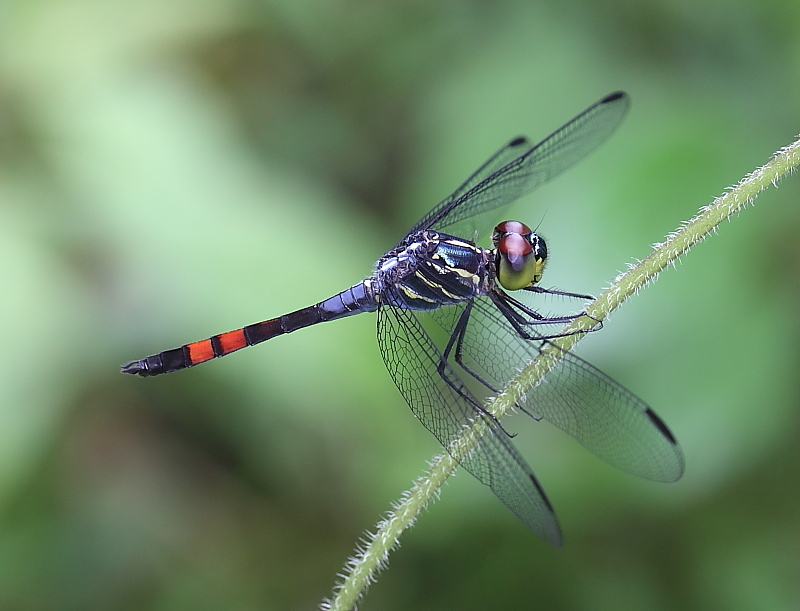 Female is generally more uncommon, but the appearance is same as male. 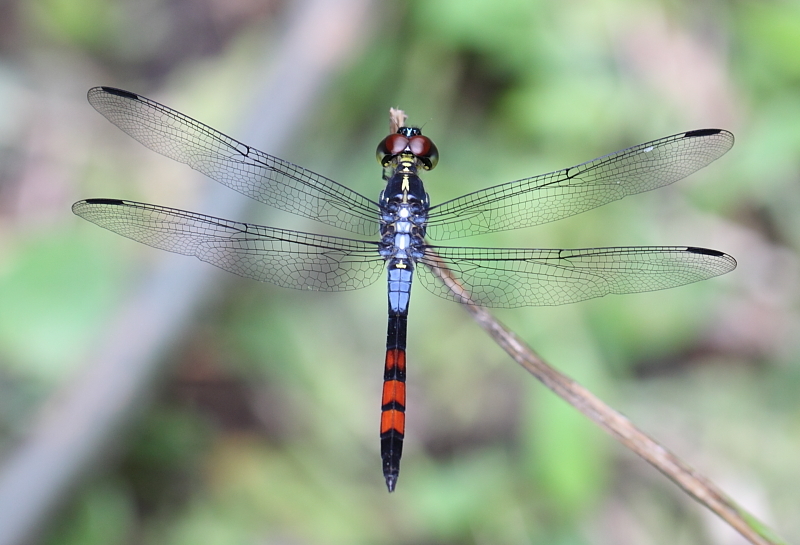 The abdomen is thicker, reddish in colour with some yellowish stripes on the first two segments. This species tend to favour open areas in the fringes of the nature reserve. 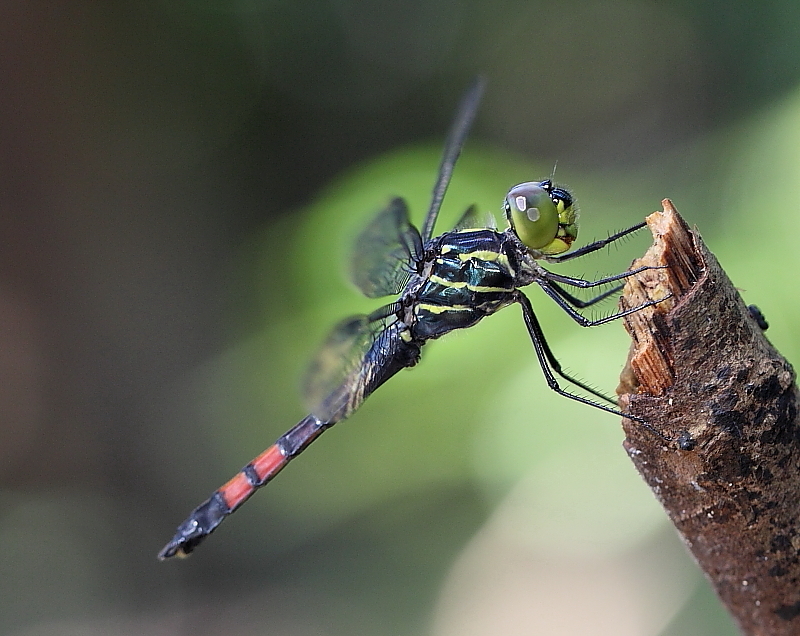 Line Forest-skimmer is a moderately large dragonfly which is rare and found only at few locations in the nature reserves. This species breed in small shallow, leafy pools in the closed forests. 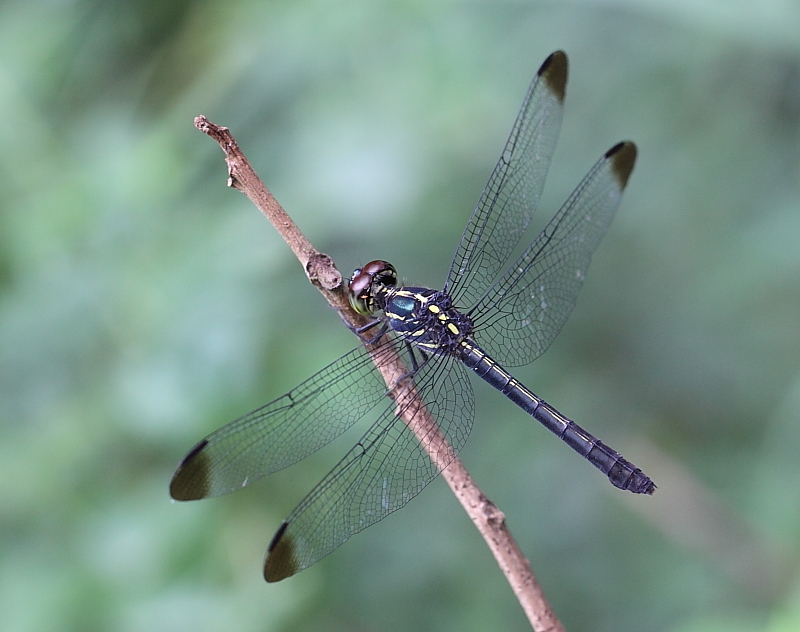 The thorax of the male is deep metallic dark blue with thin yellow stripes. 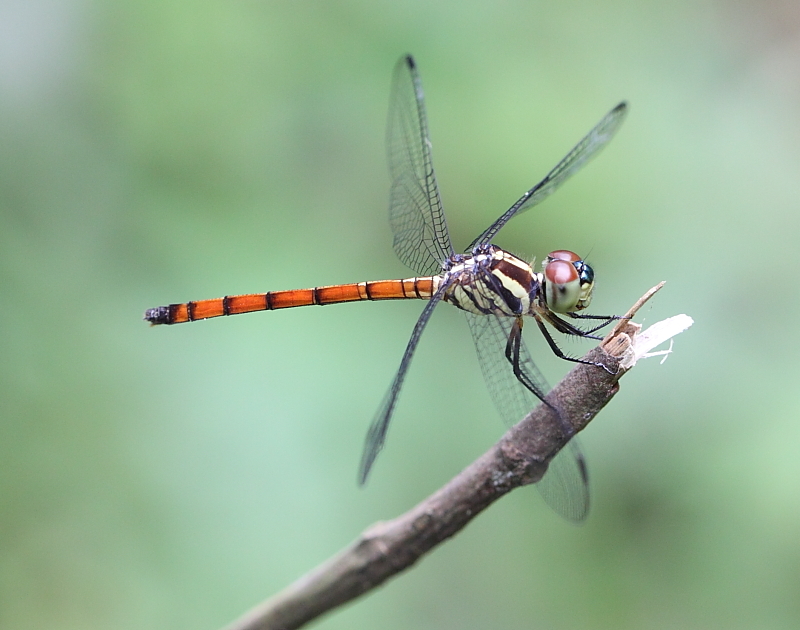 The yellow stripes are obscured due to pruinose in older males. 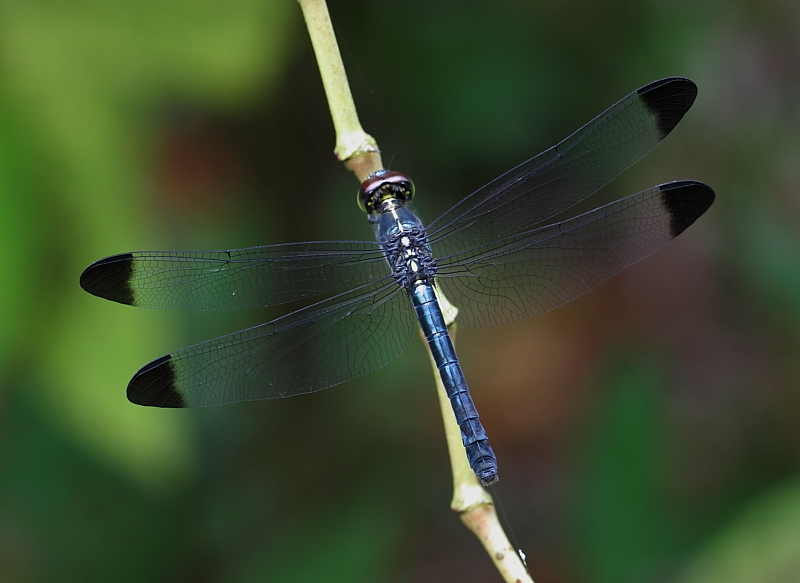 The wings of the male is clear, without any dark patch. 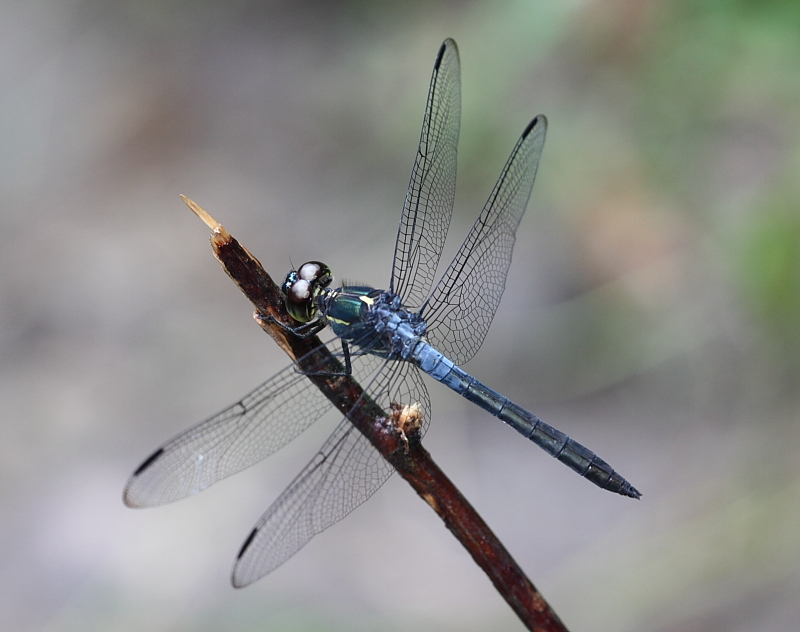 Female is slightly more robust, has a distinct yellow stripes at the abdomen with dark wing-tips. 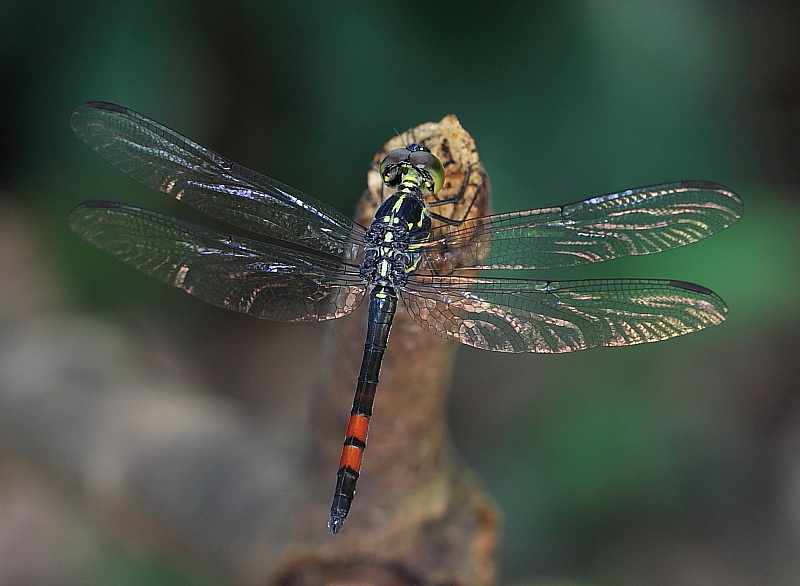 I am not sure is the dark wing tips only found in the Singapore species? 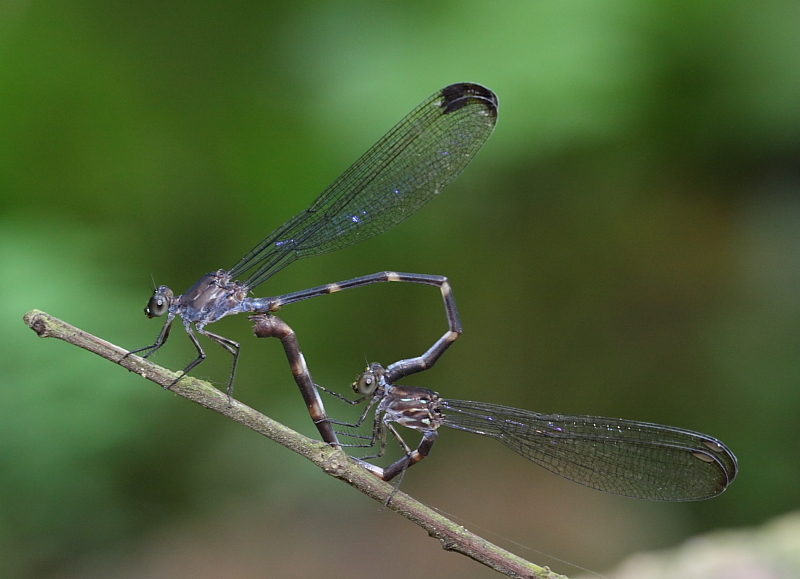 This Libellulidae species is quite common in the nature reserves and other forested areas of Singapore. 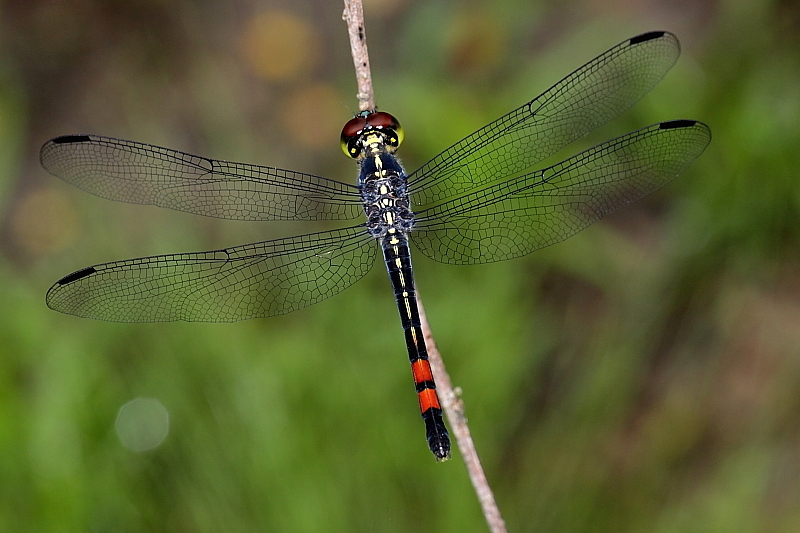 The male has thin red abdomen, slightly robust, with mottled yellow marking on the thorax. The female is similar but duller yellow markings. I also suspect a similar but darker species is of the same species as this, shown below. Very dark pruinescence but same species? 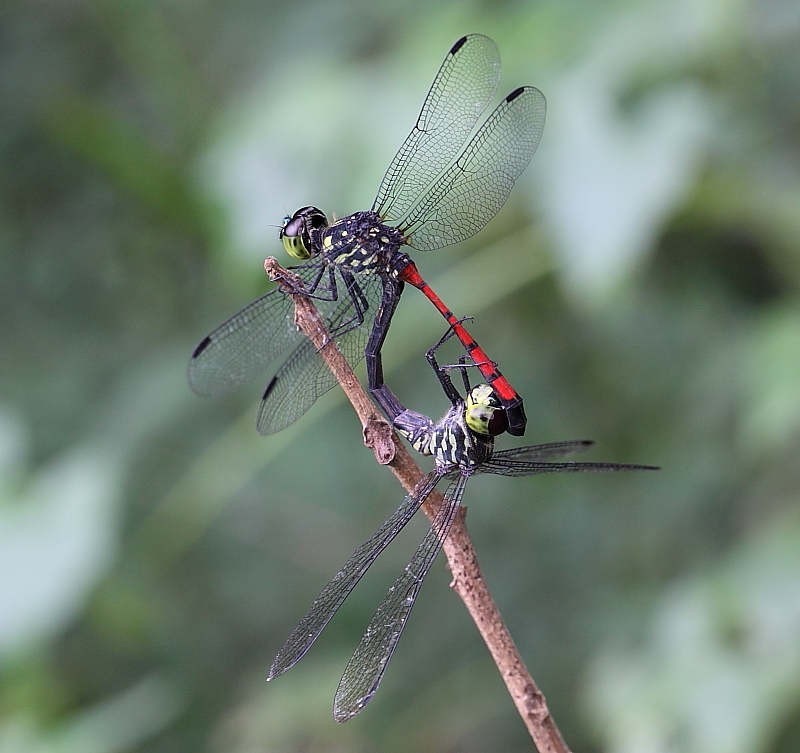 These are moderately large dragonflies which are commonly found in closed forests in the nature reserve. 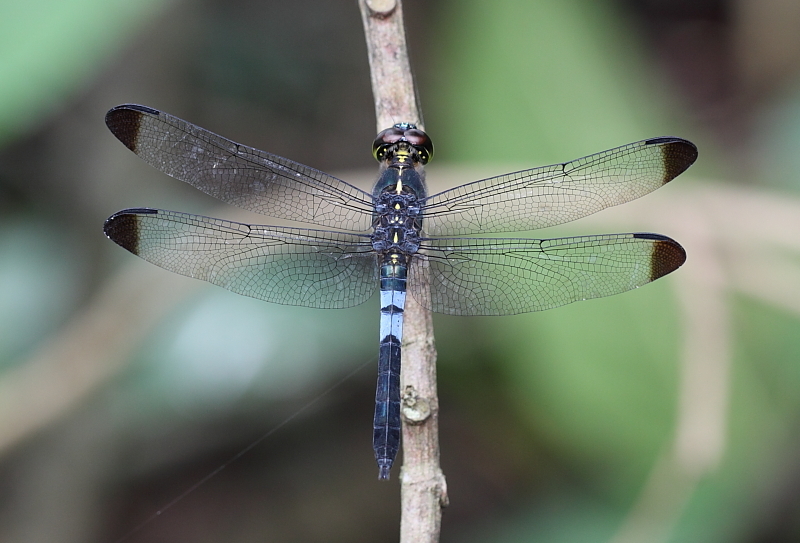 Males have dark wing-tips and blue colour markings on the 3rd and 4th segments of the abdomen. 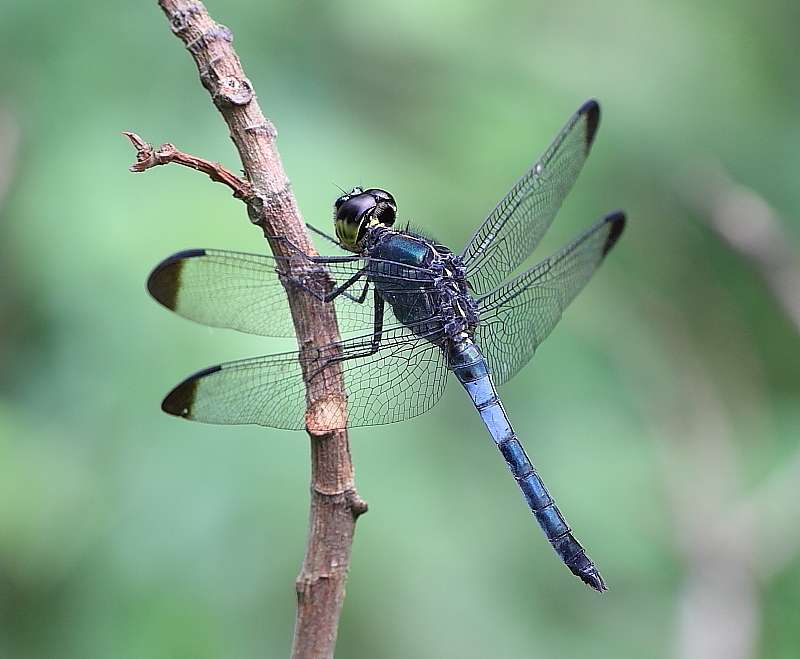 Females are larger with a shining, metallic blue thorax and abdomen, but without the blue colour markings. 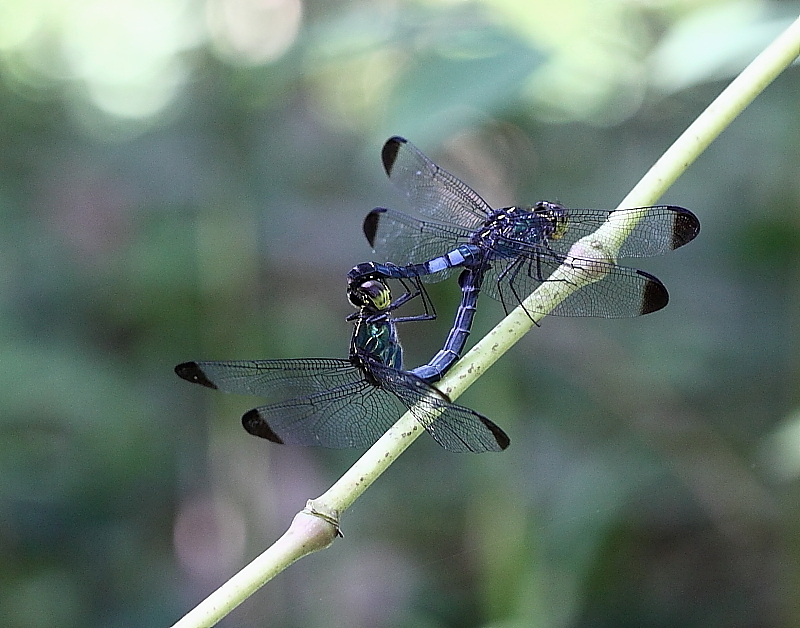 A pair in intimate position. 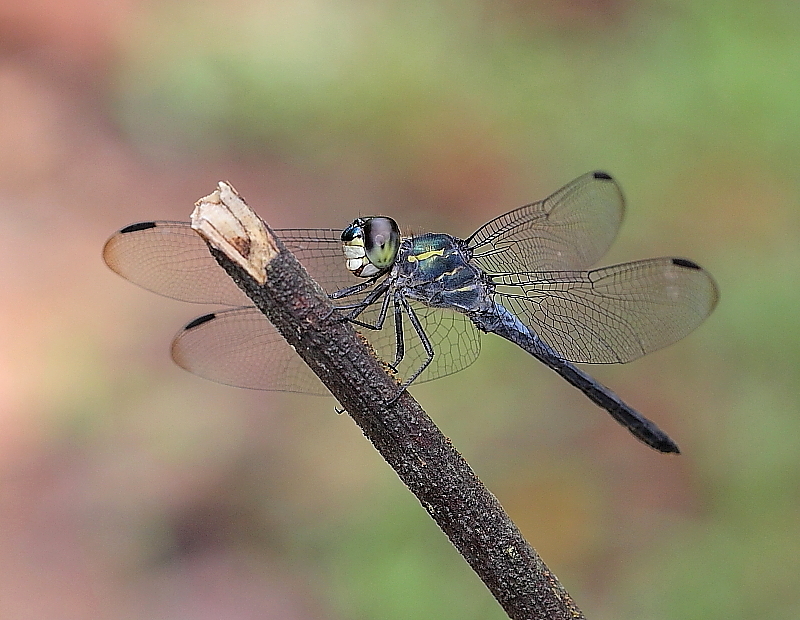 Males like to perch for prolong period on twigs above forest pools. 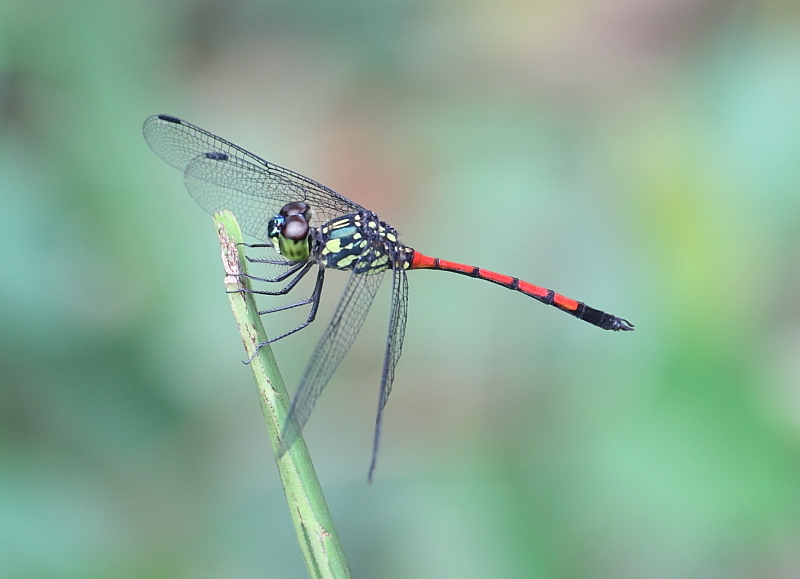 Females are not as commonly seen as males. A mating pair as seen in the above picture is rare. 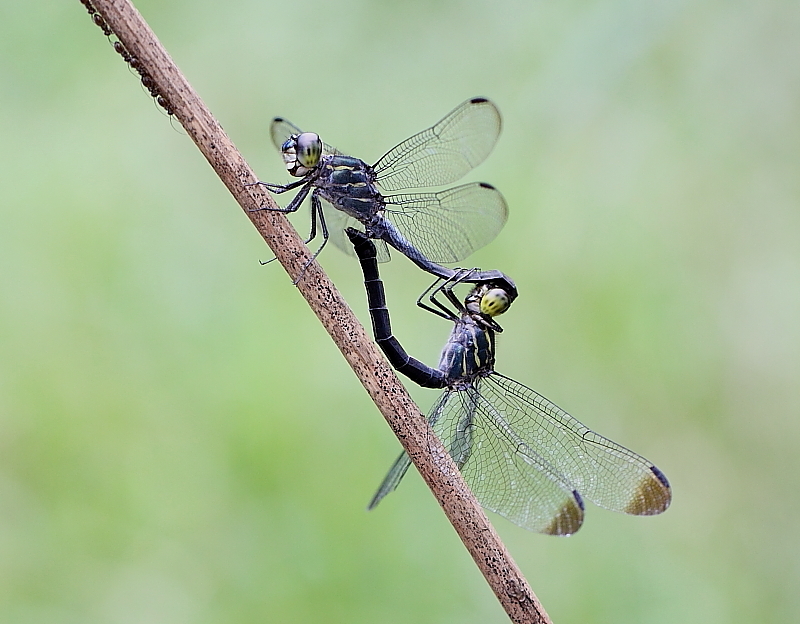 This species of dragonfly is rare which occurs in closed forest in the nature reserve of Singapore. 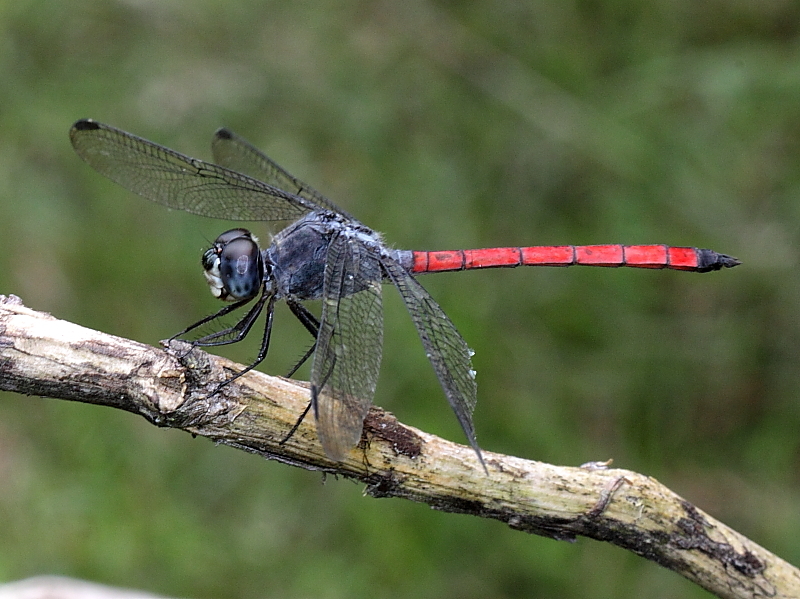 Males are very attractive with blue, and red markings on the thorax and abdomen. 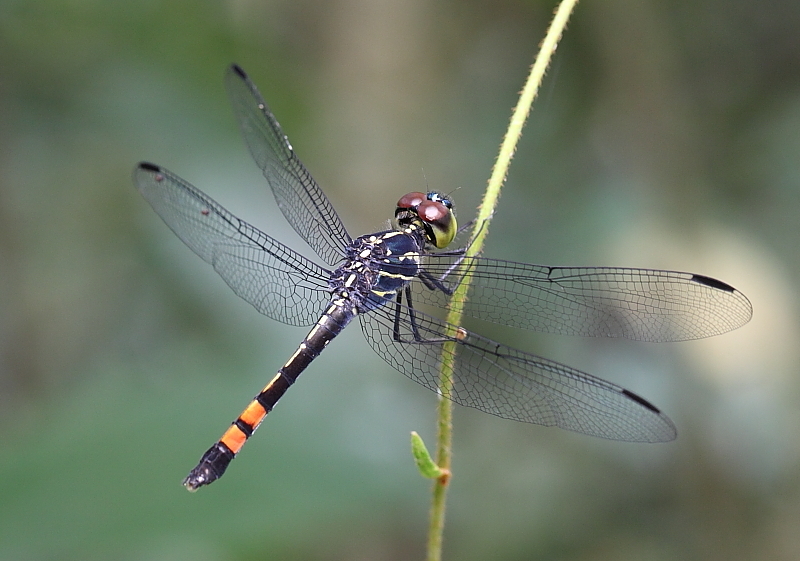 Female is slightly larger with duller red or orange markings on the abdomen. Younger female with orange markings at the abdomen. 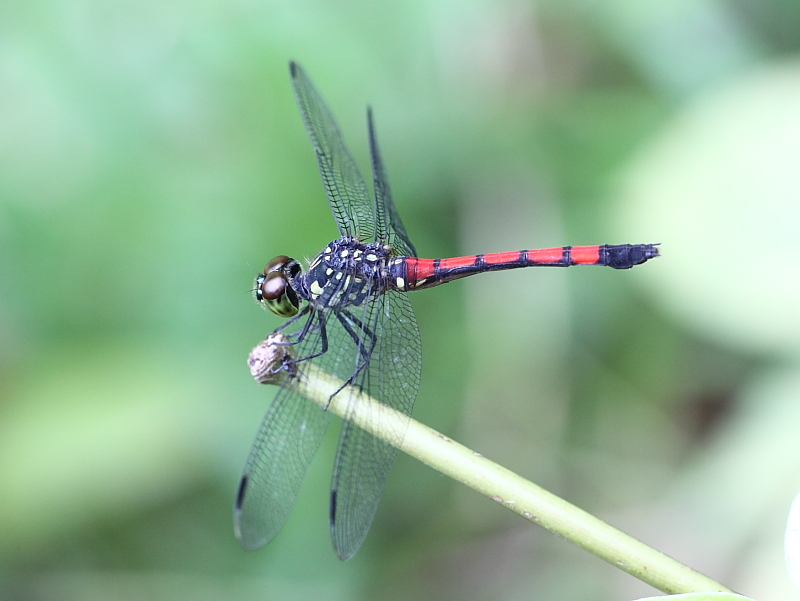 Female with red markings at the abdomen.